this week is all about the bedroom reveal i did for my daughter's on Monday. because of our new baby boy arrive this fall i have had to do some reorganizing of the sleeping arrangements and my daughters were all too happy to have their rooms combined and redesigned. i mentioned on Monday's post that the motivation for this redesign came from my bedding choice of Beddy's Bedding. i had so many questions after post from friends and family about the bedding that i wanted to do a more in depth post to answer those questions. 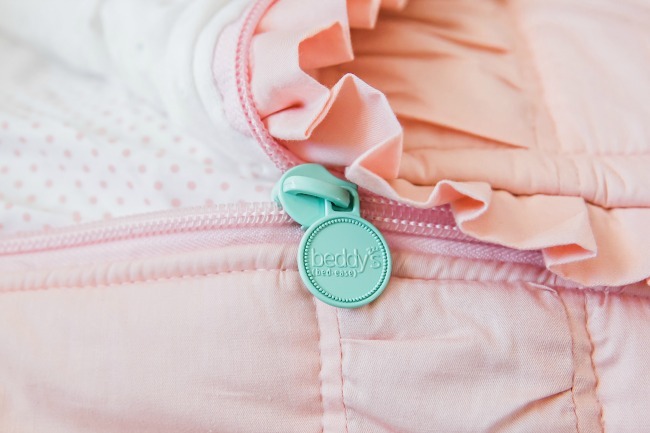 Beddy's (pronounced bed-ease) is the most brilliant solution to bedding for bunkbeds, or pretty much any bed. it is a comforter that fits over your mattress as a fitted sheet would fit. there are zippers that span the entire side of comforter on each side for comfort and an elastic that runs around the entire bottom of the comforter to give it that 'fitted' style. when unzipped there is a coordinating fitted sheet underneath and the top comforter blanket has a cozy minky fabric underneath. the exterior fabric is 100% cotton so the fit is great and it washes really well. the Beddy's style bedding comes in a wide variety of colors and styles. they fit mattresses of all sizes and accommodate for young and old, boy and girl. in fact, now that my girls have this on their bed my son has been asking non-stop for when he can get a new Beddy's comforter. Beddy's offers contemporary style to traditional allowing you to design to your aesthetic. the best part about Beddy's is actually making the bed. all that is required is a zip up the side. it is so easy, even my 4 year old daughter can make her bunk bed, and for anyone who has ever tried to make a bunk bed that is a feat!! i selected the Vintage Blush II comforter for my girls' room. i liked the light color of the fabric and the ruffles and ruching of the comforter. along with the bedding i also picked up a bedskirt and pillow set. the bedskirt is Always Enchanting White/Gold Bed Skirt that coordinates perfectly with my polka dot accent wall and the pillow set is the Chic White Pillow Set. 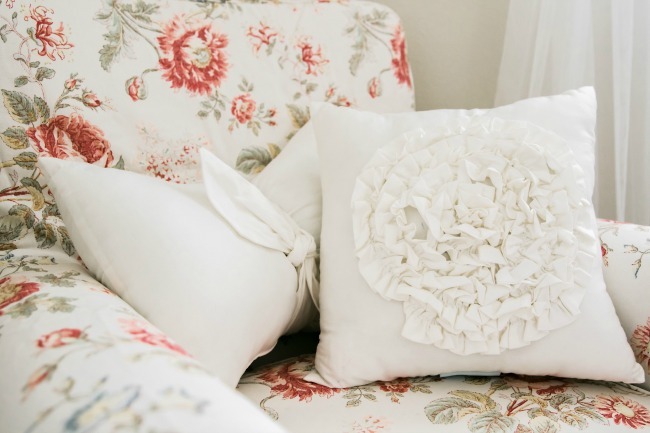 the pillow set comes with three pillows, one traditional sized pillow and two accent pillows. i thought it worked best to use the traditional sized pillow on the bed and put the accent pillows on the chair to tie the bedding in with the room. if you have any questions about the bedding please don't hesitate to reach out.